Chen, I-te. 1968. Japanese Colonialism in Korea and Formosa: A Comparison of Its Effects upon the Development of Nationalism. Ph.D. diss., University of Pennsylvania. Cheong, Ching. 2001. Will Taiwan Break Away? : The Rise of Taiwanese Nationalism. Singapore: World Scientific. Chung, Pei-chi. 2002. Crafting National Identity in Cyberspace: The Formulation of a Taiwan Nation and the Rise of an Alternative Media Culture. Ph.D. diss., Indiana University. Fix, Douglas Lane. 1993. Taiwanese Nationalism and Its Late Colonial Context. Ph.D. diss., The University of California, Berkeley. Hsiau, A-chin. 2000. Contemporary Taiwanese Cultural Nationalism. London: Routledge. Makeham, John, and A-chin Hsiau. 2005. Cultural, Ethnic, and Political Nationalism in Contemporary Taiwan : Bentuhua. Houndmills, Hampshire, United Kingdom: Palgrave Macmillan. Wang, Horng-luen. 1999. In Want of a Nation: State, Institutions and Globalization in Taiwan. Ph.D. diss., The University of Chicago. Wu, Rwei-ren. 2003. The Formosan Ideology: Oriental Colonialism and the Rise of Taiwanese Nationalism, 1895-1945. Ph.D. diss., The University of Chicago. ^ 谢长廷：大陆根本没什么中华文化 反而台湾保留的多. 凤凰网. 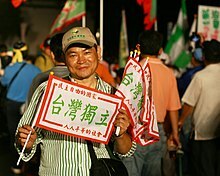 [2012年10月17日] （中文（中国大陆）‎）.